Arch Walker ran in the Class 6 handicap over 6 furlongs yesterday at Yarmouth. Daryll Holland was aboard the John Weymes trained 5 year old. Archie was drawn in stall 5, broke smartly and came down the centre of the track to lead after 1 furlong . Archie had them all on the stretch 3 out, and was clear by a length. At this stage, The Barney Curley trained Elusive Hawk looked to be travelling well and he passed Archie going on to win by a length. This was an excellent performance from Archie and it’s clear that the Dazzler gets on well with him. Archie hasn’t had a lot of luck recently but with performances like that , a win is just around the corner. Military Green ran in the Class 6 3 Year old handicap over 7 & 1/2 furlongs yesterday at Beverley . Duran Fentiman was aboard the gelding for his debut in OnToAWinner yellow and white. This was only the 3rd race of his short career and his debut in handicap company, he was draw 16 of 16, not an ideal with a bend coming so soon after the start. Military Green broke very smartly , he showed good early speed to make his way across from the outside draw to sit 3 deep in 5th position at the 1st bend. He travelled very well throughout and with 4 furlongs to go he was well in the mix. Just outside the 2f mark, Duran asked him to go on and he did , he went up to a share of the lead but faded in the final furlong to finish 6th , beaten a couple of lengths. Military won a maiden on only his 2nd start over 6 furlongs on soft ground at Redcar, he is still only learning the game and we will try him over the 6f and 7f to see what his best trip is. Initial impressions would suggest that he will relish a stiff 6f or an easy 7f just as his OnToAWinner stable mate Fast Shot does. Duran was very complimentary when we spoke to him after the race. He said that he will be winning is fair share of races. His owners can look forward to some good days out. Niall O’Brien & Yourartisonfire feature on a new website that promotes ownership of race horses (www.own1.co.uk) The feature details Nialls involvment with syndicates for the past 15 years and also the exciting partnership of Wayne Rooney, John O’ Shea and OnToAWinner. Fast Shot ran in the John Smiths Scottish Stewards cup yesterday at Hamilton. David Allan, his usual partner was racing at York and was unable to get to Hamilton in time for the race so Paddy Aspell took the ride. The ground was described as soft, heavy in places. Fast Shot was drawn widest of all in stall 16. He broke well , travelled on the right of the field and was up the pace for the most part but didn’t pick as well as he had in the Newcastle win, he finished a very credible 6th, beaten 3 & ½ lengths. Tim Easterby’s Grissom won the race which capped off a remarkable day for the Malton trainer. Tim had 5 winners on the day, including Body and Soul who won the super spint at Newbury under Duran Fentiman. Well done Tim and everyone at Habton Grange stables, a terrific day. Also, a big well done to Richard Fahey and Paul Hanagan who picked up their 1st Group 1 in England when Mayson romped to victory in the Darley July Cup at Newmarket, a day dominated by Northern trainers. Yourartisonfire and Chris Patten featured in The Journal today. 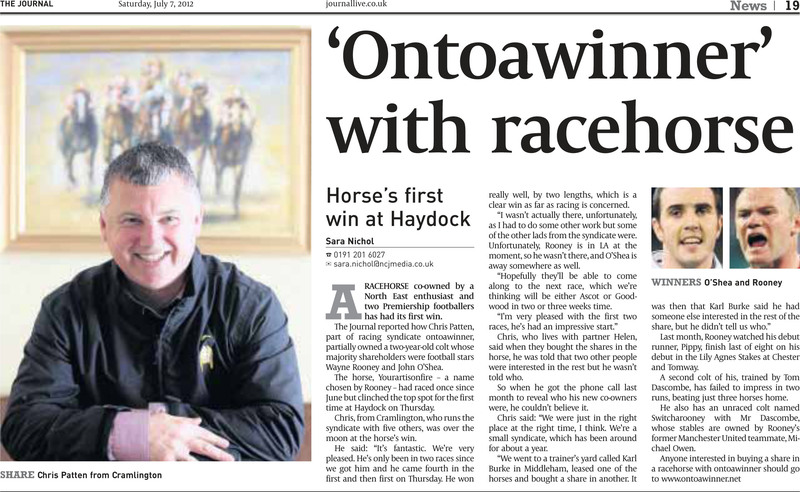 The feature describes Yourartisonfires win and the partnership of Wayne Rooney, John O’ Shea and OnToAWinner. There were only 4 runners in the race but early morning betting suggested that this was a hot maiden and there were solid claims for all 4 horses. Yourartisonfire was 2/1 in the morning but ended up a well-supported favourite at the off – sent off at a price of 6/4. He was drawn 4 of 4 on the rail and Michael was happy to sit off the pace early doors and pick them up in the last couple of furlongs if he could. As they approached the 2f mark Michael asked Youartisonfire to go on and he did, he looked to be travelling superbly but when a gap closed in front of him, Michael was forced to go on the outside and he stayed on strongly throughout the final furlong to win going away by two and a quarter lengths from Mayaasem. Michael Metcalfe told Racing UK: “They went quite steady – you can sit and wait but I thought I would get him rolling and I always thought he would pick them up in the end. When I got him wide he picked up nicely and he’d probably even get an extra furlong the way he settled. He’s very professional. This was an excellent performance from the colt, Michael and Karl. We will be racing in some exciting races before the season is out: Glorious Goodwood being a possible destination.